BITCOIN CRASH: Plunges 45% In 5 Days…How Low Will It Go? The Bitcoin Crash has finally taken place as the king of cryptocurrencies plunged a staggering 45% from its record high in just five days. On December 17th, Bitcoin reached a peak of $19,800 but fell to a low of 10,887 in early market trading today. However, the Bitcoin price has recovered from its lows and is now trading at $13,500. So, the big question to all the Bitcoin investors and crypto traders….. Will the market recover or will the crash continue? Well, if we go by charts that show assets moving up in a straight line, I believe we are going to see much lower prices. I don’t know if it will take days, weeks or months… but lower it will go. Currently, Bitcoin is fetching an estimated $4,700 profit per coin versus $136 for gold. According to the research done by Marc Bevand (discussed in the article linked above), he calculated the cost to produce Bitcoin in August was approximately $1,500. I adjusted that cost up to $1,800 for the beginning of November. At the time, the price of Bitcoin was trading at $6,500. Thus, the profit per Bitcoin was $4,700. Now, compare that to cost to produce gold from the top two primary gold miners at $1,115. 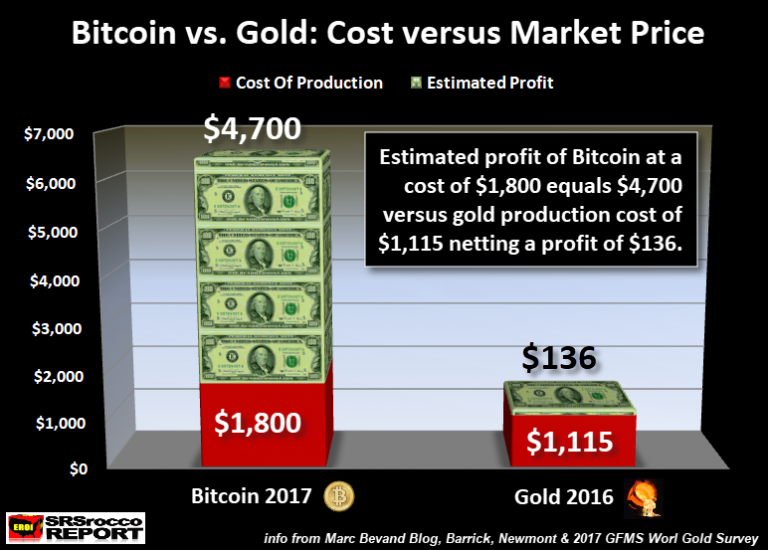 Thus, Barrick and Newmont primary gold miners were enjoying an 11% profit margin, while the Bitcoin miners were enjoying a 72% profit. Here we can see how the different estimated costs of Bitcoin production and the price movements. A few weeks back I emailed Marc Bevand and asked what he calculated as the new cost of Bitcoin production. He stated that it was between $3,000-$4,000. I didn’t make a new chart, but with the price of Bitcoin heading towards $20,000, the Bitcoin miners were making upwards of $16-$17,000 a pop. No wonder the price of Bitcoin finally POPPED. Unfortunately, those analysts that moved away precious metals and into Bitcoin and Cryptos fail to understand the DIRE ENERGY predicament we are facing. They believe we are heading into a BRAND NEW HIGH-TECH world with lots of neat new gadgets and billions of Dollars in cryptocurrency profits to live life PHAT on the HOG. Well, as my favorite expression goes… GOD HATH A SENSE OF HUMOR. As we can see in the chart, Bitcoin dropped from a high of $1,150 to $600 quite quickly. It then bounced back up to almost $1,000, before selling off even lower to $500. 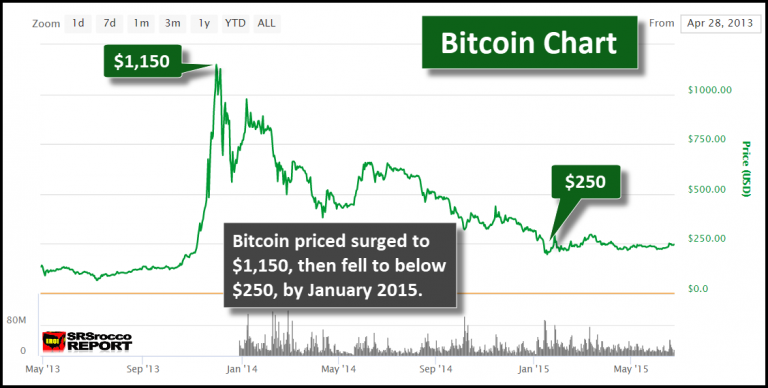 Although, this time around, Bitcoin’s plunge below 75% can occur much quicker…. even in days. But, I am not going to make that call. I stopped giving price targets for any asset class years ago. It’s a fool’s game. Regardless, if we assume the latest Bitcoin’s mining cost is $3,000-$4,000, then we still have a long way to go. Furthermore, here is a chart showing that Bitcoin’s transaction fees increased from 31 cents at the beginning of 2017 to $55 currently. Thus, the higher Bitcoin goes in price, the more unusable it is for payment of goods and services. Who wants to buy a $5 cup of coffee at Starbucks with Bitcoin if it cost you $55 for the transaction? I have to tell you, that chart looks very UGLY. Right now a lot of new Bitcoin investors are wondering if they should hold on or to sell before it goes down any further. While some analysts have stated that Bitcoin will reach $50,000 and then $100,000… this sort of trading activity can drive a person crazy. Mike explains in the video that HashGraph will make a lot of the cryptocurrencies obsolete. It takes a massive amount of energy just to do one Bitcoin transaction that it is not really useful as a currency or payment system. The Hashgraph technology does the same sort of thing as Bitcoin and the other cryptos, but it takes very little energy. As I mentioned in my previous article, the skyrocketing Bitcoin price is what has SUCKED IN most of the demand. Only a small percentage of techie Geeks were interested in what Bitcoin had to offer. It wasn’t until Bitcoin’s price went into the stratosphere that investors starting buying like crazy. Now, we see Bitcoin mentioned on the major financial networks. Again, nothing goes down in a straight line. I wouldn’t be surprised to see Bitcoin rally here for a while. It could actually go back up significantly before selling off again. But, if Hashgraph can do with Bitcoin does at a fraction of the energy, then it is likely that Bitcoin will go down as the biggest Bubble in history.